The digital-graphics specialist is not a great dividend play right now. While waiting for a better entry point, consider Cisco Systems, Coca-Cola, and IBM instead. NVIDIA (NASDAQ:NVDA) turned heads in the dividend-investing community four years ago. Riding strong cash flows in the face of weakening PC system sales, the graphics chip veteran started up its first-ever dividend policy at an effective yield of 2.4%. Fast-forward to 2016, and things have changed. NVIDIA has found additional target markets and rolled out a solid next-generation processor platform. Share prices have more than quadrupled since the first dividend was announced. Dividend payouts have not kept up with the skyrocketing stock price, driving NVIDIA's dividend yield all the way down to 0.7%. This dividend looked good at launch and may become great again. But income investors had better wait for lower share prices or dramatically higher quarterly payouts before coming back to this stock. Locking in effective yields at this anemic level just won't do. While waiting for a better buy-in window on NVIDIA, the market is stacked to the rafters with solid dividend payers. Let me explain how Coca-Cola (NYSE:KO), IBM (NYSE:IBM), and Cisco Systems (NASDAQ:CSCO) can fill the void left by NVIDIA's absence from the serious-dividend market. 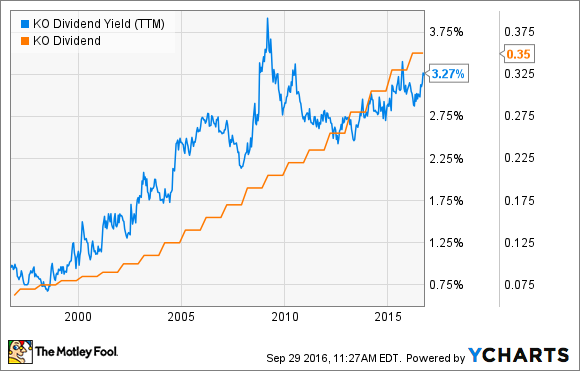 KO Dividend Yield (TTM) data by YCharts. If you had bought Coke shares 20 years ago, two-thirds of your total return across those two decades would have come from reinvested dividends alone. Today, Coca-Cola offers a princely 3.3% dividend yield, backed by a fantastic string of payout increases. The 20-year chart above is downright beautiful, showing the soft drink giant's commitment to predictable dividend boosts. Payouts have increased by 460% in 20 years, and Coke has provided annual dividend boosts without fail since 1963. Chances are, the increases will keep coming for the foreseeable future. Meanwhile, Coke's share prices haven't exactly followed NVIDIA's skyrocketing lead in recent years. Health-conscious consumers are turning away from sugary drinks, and neither Diet Coke nor Dasani water has filled that gap so far. The S&P 500 market index has nearly doubled over the last five years, but Coke shares rose only 25%. Hence, Coca-Cola's dividend yield is currently inflated even further by modest share-price gains. Do stay away if you see the beverage titan's demise written in current consumer trends. But if you think that the Coke brand will bounce back, this would be a great time to lock in some great dividend yields on a high-quality stock. After establishing Coca-Cola as an objectively great dividend booster, it's almost shocking to see IBM's payout data next to Coke's. That same 20-year time span saw IBM lifting its quarterly payouts an astonishing 1,300% higher. Paired with occasional bursts of rapid share-price gains but a soft stock chart over the last four years, IBM's dividend yield ends up just above Coke's with a 3.4% reading. IBM used to be a one-stop shop for every IT product and service an enterprise client might need. CEO Ginni Rometty has been dismantling that storied business model, doing away with low-margin hardware sales in favor of more profitable software and services. Big Blue now focuses on artificial intelligence, cloud computing services, and the back end to Internet of Things data crunching. It's a drastic makeover, and investors have not welcomed it with open arms. Personally, I picked up a few IBM shares last year because the new direction looks like a good idea -- and IBM shares are starting to look downright cheap. If that also buys me a strong dividend policy for the long haul, all the better. And right now, it makes perfect sense to flip my investment thesis on its head, buying Big Blue for the dividend and taking any turnaround-flavored stock gains as a bonus. IBM Dividend data by YCharts. 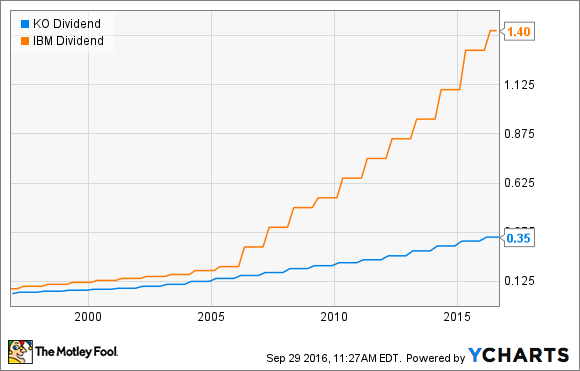 Yes, IBM is a fantastic dividend-growth play. But Cisco blows even Big Blue's boosts out of the water. Granted, the data networking veteran doesn't have the multidecade dividend history of Coca-Cola or IBM. But the young dividend policy, first implemented in 2011, is already off to the races. 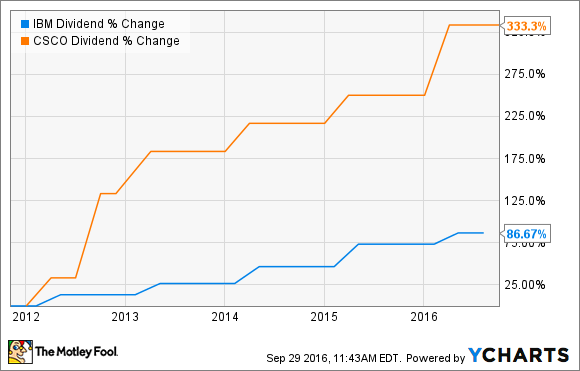 In many ways, Cisco's dividend angle is the closest thing to a drop-in NVIDIA replacement. The dividend policies are both young and unproven, backed by technology specialists with long operating histories, and generally pointed skyward. The main difference is that Cisco hasn't seen anything like NVIDIA's recent stock gains, making for a plumper 3.3% yield and a more reasonable valuation in general.